Four score and seven years after the Declaration of Independence, all that already had happened in United States history began to draw to a close. All that would happen in a changing nation would begin to unfold. 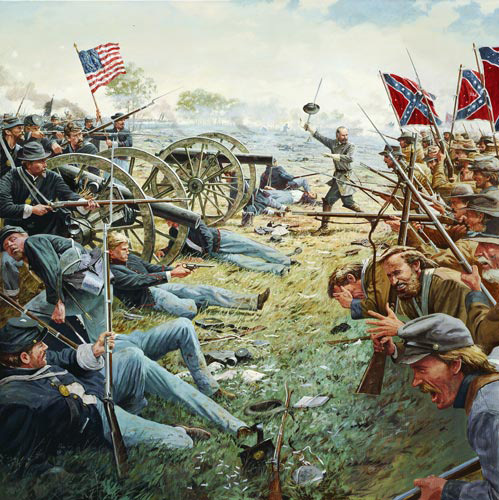 With a single shot fired by Lieutenant Marcellus Jones on July 1, the clash at Gettysburg became the most devastating battle in American history, with some ten thousand dead, ten thousand missing, and thirty thousand wounded. This conflict of region against region, army against army, even brother against brother had its ostensible origin over states’ rights versus preservation of the union. After Gettysburg it became indisputably a war over the end of slavery in the South. Old American heroes passed into history after Gettysburg. They would be superceded by new heroes who would be remembered for having been there, for having taken their side’s stance right in the battle lines of this tragic farm village. Among the survivors at Gettysburg was Horace Mangrove Giannini, from Virginia. Giannini lived to return to an embittered South whose impoverished and end-of-slavery destiny had become increasingly obvious after Gettysburg. Giannini was the grandson of Thomas Jefferson’s gardener, Giovanni Antonio Giannini, who installed and supervised the plantings of Monticello. Giannini’s Southern troops had faced the 11th Regiment of Pennsylvania Blues, commanded by Colonel Samuel Jackson. Jackson survived to become a prosperous merchant in western Pennsylvania. Jackson’s grandson, on July 1, 1944, would become group commander of the 445th Bombardment Group, 8th Air Force in England. That man, beloved actor Jimmy Stewart, then climbed into his aircraft and flew his 21st bomb mission of the war in Europe, in support of the allied invasion over Normandy. He would fly many more before the end of the war. Giannini’s gardens survive at Monticello, one of the most peaceful and revered places in the United States. Many of his descendants still live in the area. None of Stewart’s immediate family live now in the area of Pennsylvania their grandfather and great-grandfather Jackson fought to preserve at Gettysburg. Jimmy Stewart’s son, Ronald McClean Stewart, a Marine officer, died in combat, June 8, 1969, in Viet Nam.